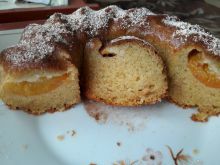 "Nothing can compare to the taste of Homemade Cake with Apricots." Heat the oven to 356°F (180 °C) and lay out baking paper in a baking form with removable sides. In a bowl, beat the butter and sugar to a fluffy cream. Gradually, while still beating, pour in the 3 eggs you've beaten ahead of time, in lots. Add the vanilla. Sift the flour with the baking powder and salt. Add them in lots as well, while stirring with a spatula. Put the dough in the baking form and even it out. 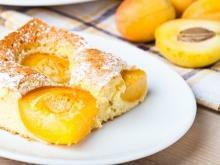 Cut the apricots in 2 and remove the pits. 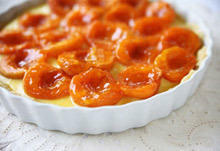 Distribute the apricots along the entire surface, slightly overlapping the pieces. Sprinkle with the rest of the sugar and bake until ready for about 50 min. Once you take the cake out of the oven, leave it to cool in the form.